With the CTFPAD-2 you get a real generalist with full Windows 7 and Android compability. This UMPC does not only enable you to use any Windows-compatible software, but also gives Internet access through WLAN, Bluetooth or HSDPA 3G. Device comes without pre-installed operating system ! You can install your own Windows 7 copy (Home/Pro/Ultima) by USB-CD-drive or USB stick with help of “Microsoft Windows 7 USB/DVD Download Tool”. Alternatively you can install our Android-Image. 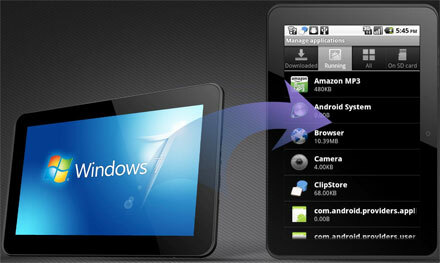 There even is possibility for Dual-booting Android+Windows 7.